Perfect for stowing biscuits in the overhead for those long flights. 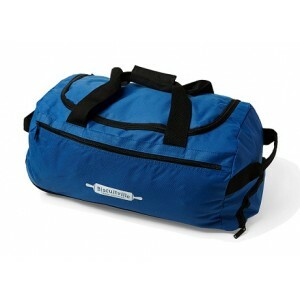 22 " x 13 " x 9 " polyester, royal blue, carry-on duffel. Spacious main compartment with u-zip opening and a large exterior pocket for additional storage or quick access to passports, wallets, or anything else you need to keep easily available. Telescoping handle extends to 15" and integrated in-line skate wheel system for smooth rolling.